Mob Psycho 100 follows Kageyama Shigeo, a.k.a. “Mob,” a boy who has trouble expressing himself, but who happens to be a powerful esper. Mob is determined to live a normal life and keeps his ESP suppressed, but when his emotions surge to a level of 100%, something terrible happens to him! As he’s surrounded by false espers, evil spirits, and mysterious organizations, what will Mob think? What choices will he make? 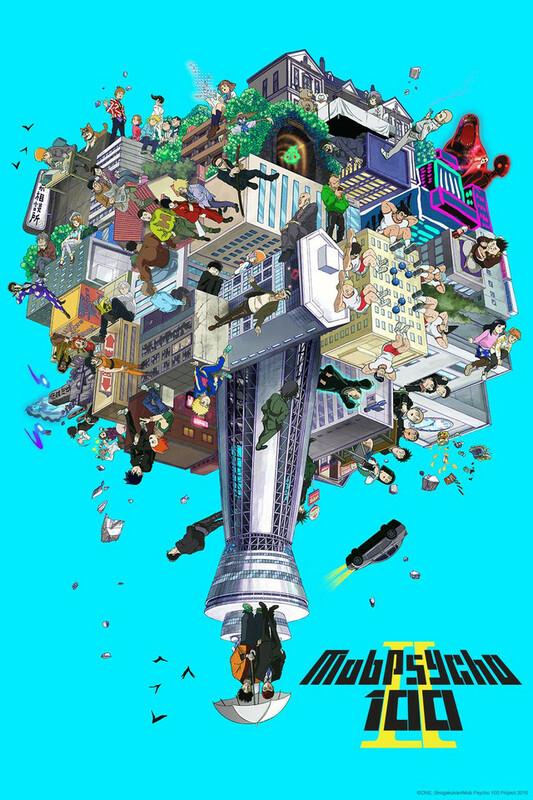 Some of you remember how excited I was when I finished Mob Psycho 100 and reviewed it for this blog. I was enamored with the beautifully animated scenes, perfect pacing, dynamic plot and round characters. When season two was announced, I was a strange mixture of excited and skeptical. It’s difficult to create something with such concentrated excellence as MP100, it’s even more difficult to do it a second time, picking up where the first left off. I will say through much of my watching experience, I was disappointed. Namely, I was upset with the plot and pacing, two things which I had sung praises for not too long ago. Many of the episodes seemed unnecessary, or could have been restructured. The season is a slow burn in my opinion. But the burn is a raging fire that is well worth the wait! The animation is as brilliant as season one, just fyi. The villains Suzuki and Serizawa act as foils for Reigen and Mob respectively, which is a nice touch when we consider episode 5 wherein Mogami places Mob into an alternative reality where he has no meaningful connections and no psych abilities. Serizawa is incredibly lonely and latches on to his master, the only one who was capable of bringing him out into the world with the gift of an umbrella. This being said, their motivations are rather shallow. Villains, not protagonists, act as the backbone for plot. We don’t understand their personalities, even. Why is Sho rebelling against his father now of all times? There are many unanswered questions that will not get resolved in another season due to how the series played out, and with the Claw disbanded, it’s hard to imagine there will be another season. But that’s not the only reason. The MP100 series is a coming of age story. In this series, Mob’s characterization is apparent, his growth seemingly natural and realistic. While he doesn’t confess to what’s-her-name, he gains a lot of insight into who he is as a person, what his values are, and how to be hard on those around him. It’s hard to imagine them making another season with his character already so far developed And it’s not just him: Reigen also gets a phenomenal arc and we can argue this coming of age trope applies not just to the pupil, but to the master as well. Overall, the series was good. There were other ways the creators could have gone with script-writing which would have been more saturated or valuable elements to achieve the same character growth. However, there’s a lot going on in the world of script-writing. We’ll never know what was cut, or why things unfolded as they did. It’s easy to say “this is how something should have been written; this would have been way better if, etc”, but to do so is to underappreciate the complexities of this kind of storytelling. The show is entertaining; the climax is worth the wait; the characters are brilliant as they were in the first season. Thanks for reading, my lovelies! It’s a wonderful one, for sure! Definitely ranks in my top shounen shows of all time!